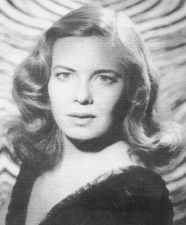 In 1950, K.T. decided to make a complete break from Nelson as it seemed he would never break up with Jeanette or leave Ann. She decided to pursue her acting career in London at R.A.D.A. During the 1950s she acted on stage and in early British television and associated with such acting greats as Sir John Gielgud, Richard Burton and Peter O’Toole. Late in the decade she met up briefly with Nelson Eddy and decided to move back to the States. However, that was her last meeting with Nelson. 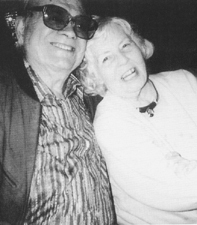 Ms. Ernshaw attended a Los Angeles Mac/Eddy Club meeting years after the hardback edition of Sweethearts was published and agreed to speak on the record to Sharon Rich. Her new information was incorporated into the updated, softcover edition of Sweethearts. Although Ms. Ernshaw – like most of Nelson’s friends – had wrestled with going public with what she knew, she finally felt that she had to set the record straight because she felt Nelson’s character had been maligned by many on the Internet, and she knew firsthand that Nelson and Jeanette were intimately involved for many years. Before coming forward, Ms. Ernshaw wrote a novel in which her main character was based on the Nelson Eddy she knew, providing rare insight into his character and personality. To Love Again is available here. Ms. Ernshaw joined us for a London club meeting some years back and also spoke on our first Mac/Eddy cruise. Ninety years young in 2012, she attends all the Los Angeles area club events. We published a lengthy interview with her in Issue #62, which includes personal data that she was never willing to discuss publicly until now. The excerpt below is from that interview. Article and photos copyright ©2003, 2006, all rights reserved. Photos below: left-K.T. Ernshaw today pictured with Frank Laric at a Los Angeles Mac/Eddy event, right-K.T. Ernshaw as Nelson Eddy knew her. Q: We are grateful that you have agreed to talk about your relationship with Nelson Eddy. While we understand and accept that there are certain aspects of it that you don’t wish to share publicly, you are in a position to know what Nelson’s behind-the-scenes life was like, and to set the record straight on that score. And also, even though your book was written as a novel, your observations about Nelson come not from a fan’s viewpoint, but from someone who knew him intimately. A: We had both given our word not to reveal it or discuss it. Later, there were other reasons, but mostly I think because it was special to both of us, and keeping it so was important to each of us. Only two other people were ever aware of the relationship [Ted Paxson and Ms. Ernshaw’s godmother] and neither of them would talk. When all the others were no longer alive, it remained my personal private affair, which I didn’t consider anyone else’s business. What eventually changed my mind was discovering not only the nonsense being printed about him, and the tendency to ignore or downplay the importance of his career and the contributions to both music and sound recording, but also the ridiculous schism between the Nelson Eddy ‘fans’ and the Jeanette MacDonald ‘fans.” I knew that much of it could be traced to Nelson’s almost paranoid desire for privacy in his personal life and his willingness to lie blatantly to the press whenever they threatened to invade that privacy. Someone asked me recently why he just didn’t come out and admit the love affair with Jeanette if it was true. Unfortunately, anyone who grew up since the sixties hasn’t a clue about what life and the moral code was like in the thirties and forties, and it is very hard to make them understand circumstances so far removed from the present day equivalent. Such a revelation would have caused an unholy scandal in that time and would have brought down the wrath of Louis B. Mayer on both their heads and Louis’ wrath was not to be treated lightly if you wanted to go on working in films. Q: Okay. We do know that when you first met him, Rose Marie was out and he was experiencing the full effect of movie stardom. His 1936 concert tour was a fabulous success. His personal life was little rocky, having just gone through a break-up with Jeanette, but his whole life was still ahead of him—and the future seemed rosy. We know that you two met and hit it off. We can also do the math and understand that there was a bit of an age difference between you two. A: I had never expected that this would be more than a wonderful interlude. He was, after all, a famous movie star and his destiny was elsewhere. And I knew this. There is no way I can describe that time and explain the glorious time that it was for me. I later came to realize that it was a very special time for him as well. He had been having furious rows with Jeanette and she was “off again on again” about marrying him and he was in need of something quite different. In fact, it set the pattern for the later relationship for the rest of our times together. Over the years I kept track of what happened to him. We did not communicate even though I had a phone number that would reach him if the one possible contingency had occurred. He was prepared to face that and take care of me had that happened. It did not. When the word of his marriage came out I was shaken, but I could only hope that it would be a happy one. It was some years before I learned that it was not. Q: So, Nelson did not consider that he was sterile and was, in fact, perfectly capable of fathering children. Q: After that initial time, you didn’t see Nelson until 1942. [After the war] I soon realized [Nelson] was also in a state of flux as far as his career was concerned. He had been able to put things on hold, with the pressures of the war; now he was trying to make decisions about his life. He was concentrating on broadcasting and seemed to be doing shows a couple times a week, while I was just as busy at theatre school. There was such a shortage of women, as most students were ex- G.I.s and naturally, at that time, men. We women were much in demand and on several occasions, I was doing three shows at the same time, rehearsing two and appearing in a third! It was good training for my later time in repertory in England. ….When I did see him, I knew immediately if there had been trouble with his wife or a disagreement with Jeanette….The differing schedules made for some strange meeting times. When he was recording he often worked late. I generally finished with performances by eleven, but he might not be through until one in the morning. Somehow we worked it out and still managed to find time to spend together. I knew he was seeing Jeanette, he frankly told me so, but there were problems there, and despite everything, I knew he still had reservations about her refusal to divorce Gene, though she apparently talked of it. Whether he would have given Ann whatever she wanted to be free of her if Jeanette had agreed I can only guess. I know the relationship caused him a lot of grief. These times were variable. Sometimes it was once a week, others several days running. It depended on what his schedule was and what else was happening in his life. My schedule was fairly constant; rehearsals and performances. To the best of my knowledge, he only saw one of my performances. It was as Ruth in My Sister Eileen. It suited me to a “T.” There were long months of gap when he was on his annual concert tours each winter, but he would sometimes call me at my Godmother’s from wherever he happened to be. From the very beginning, I set some ground rules of our relationship that we abided by. I would accept nothing tangible from him. The only exceptions were the place where we met, food when we ate together or sometimes he would bring something for me, even if he had already had dinner, and perhaps flowers or occasionally (very) candy. It was during ’47 that I bought my own car. It was sometimes politic to use mine as there were people (press or gossip columnists or their informants) who made a point of identifying celebrity vehicles. It didn’t matter if we were out of town, but in LA one needed to use caution. Ann had enough reasons to make his life miserable. She didn’t need any more. As for Jeanette, the merest hint from someone that he had been seen with someone else (female) would bring on recriminations and a row that would ensure a period of separation…. Q: But you did a successful screen test. A: Believe it or not I was called to MGM for an interview with none other than Louis B. himself. One might say I blew it. I prefer not to think so. I have never taken to men’s roaming hands without my expressed permission and as far as I was concerned, I wasn’t about to make an exception of Louis. The end was that I told him to keep his hands to himself and if he didn’t, I would send him home to his wife in a state of impotency for some time. Needless to say, I was never called back to MGM! That didn’t really matter to me, and Nelson thought it was hilarious.